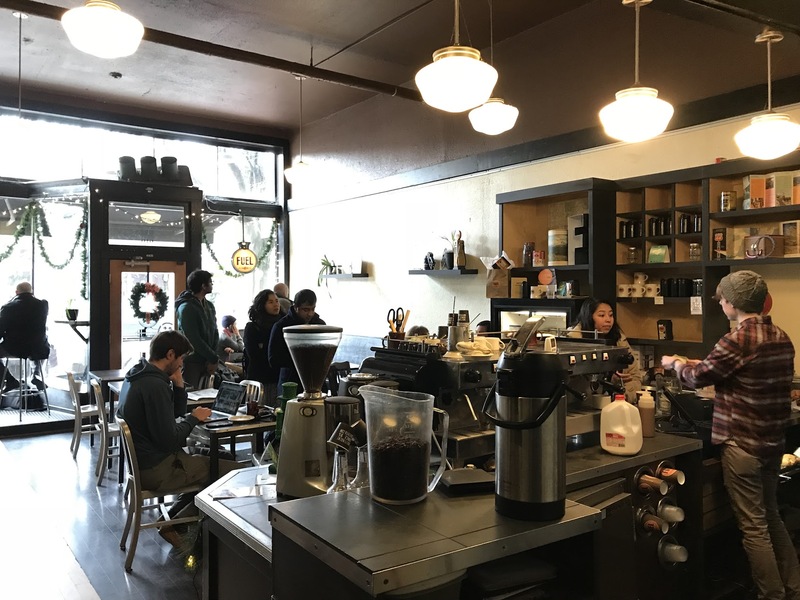 In addition to serving delicious high-quality coffee and espresso drinks, Dani Cone’s cafe Fuel Coffee is known for its friendly service, great décor, and inviting atmosphere. The work of local artists is on display, adding to the coffee shop’s neighborhood feel. Dani Cone started her first business in elementary school. Every Friday before school, Dani’s father drove her and her sister to buy flowers at the wholesale market. After school they’d roam Mercer Island selling their “friday flowers,” armed with business cards and emboldened by their business license. It wasn’t until the ripe age of fifteen that she got a taste of the industry she’d fall in love with, as a barista. She continued to make coffee through high school and college, but in time Dani became restless. “Next thing you know I’m in my mid to late 20s, working at Vita, and I’m like ‘well, what am I going to do?’” said Dani. “I don’t roast coffee, I didn’t want to be in sales.” The joy she felt as a barista and her background in small business gave her the answer: start her own coffee shop, Fuel. But Dani didn’t break ties completely with Caffe Vita. Fuel’s coffee is made with Vita’s beans, a symbol of the gratitude Dani feels for her old haunt. Vita’s commitment to fostering relationships with farmers and sourcing ethically is something Dani shares. The shelves at Fuel’s Capitol Hill location are decorated with memorabilia from a simpler time. Maps behind the counter add a personal touch to the vintage decor, recalling the many road trips that Dani Cone herself took during her college years. Biographies of baristas give customers a name (and hobbies!) to attach to the faces they see there.